Note: Color of the tip of gun may vary. Everyone knows the stories of all the typical pirate captains that sail the Seven. Who even cares what else there is to be said about Blackbeard? Davy Jones could rise back up to the surface and his stories wouldn't even fill a sail. Even Captain Hook is just old. But, when a young buccaneer steps foot onto the deck and commands the ship to sail places that no other would even consider, well, that is exciting news! (Imagine Kid Hook befriending Peter Pan!) Still, no kiddo captain is going to last very long without the right gear. Our quick-fingered designers have their own workshop on Pirate Island, though, and have crafted the perfect pistol for all your Captain Kid's needs. 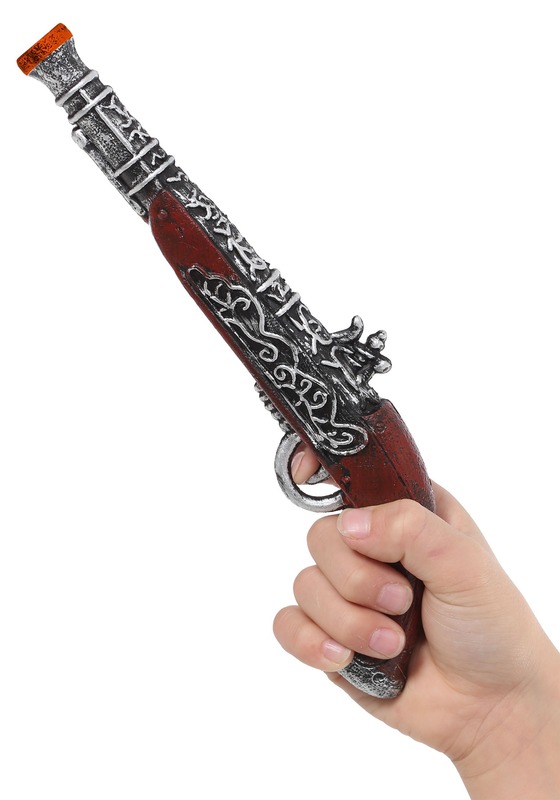 This detailed toy gun would make even the famous pirates jealous thanks to the perfect styling of its molded plastic to look like it is made of wood stock and silver metal, all with an antique flair. Measuring 9 inches long, this is easy to wield for your pirate pal and will help them conquer the seas before their teens are through! The only way to sell the success of a particular pirate is to look how long they've been sailing on the seas. So, no matter how you look at it, when your kiddo starts their buccaneer days early, no other pirate could ever hope to match them! Ensure that they have the perfect path with this luxurious and exclusively authentic Kid's Flintlock Pistol!